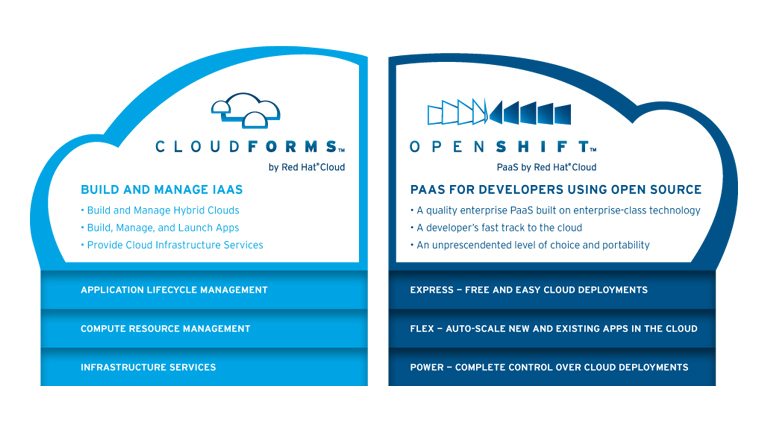 Updated: Red Hat (s rht) today is launching two new cloud computing offerings, infrastructure-as-a-service software called CloudForms and platform-as-a-service software called OpenShift. CloudForms helps users configure, deploy and manage virtual resources whether based on-premise or in the cloud, and OpenShift is Red Hat’s incarnation of the Makara technology that it bought it November. It comes in three versions — Express, Flex and Power — and can run atop public or private cloud resources. The new offerings will be critical to Red Hat’s goal of competing with Microsoft and VMware as a major software vendor for the cloud computing era. Update:The news is officially being announced later today at the Red Hat Summit, but some information is already up on the Red Hat site. I’ll have more information later today after a call with Red Hat CTO Brian Stevens and will update this post accordingly. During a press conference today, Issac Roth, Makara founder and current direct of cloud product marketing at Red Hat, noted that Red Hat plans to open source OpenShift at some point, but that there is no specific timeline yet. Presumably, this will be after the product, which currently is available as a developer preview, has been worked out by beta users and is fine-tuned a bit more. OpenShift supports Java, Python, PHP and Ruby applications, including framework support for Spring, Seam, Weld, CDI, Rails, Rack, Symfony, Zend Framework, Twisted, Django and Java EE. Red Hat has formed a strong ecosystem around OpenShift, which includes NoSQL vendors Couchbase and 10gen, cloud provider OpSource, database vendor EnterpriseDB and web-development platform eXo, among others. BMC Software also is part of the CloudForms ecosystem and will be partnering with Red Hat on a cloud lifecycle management product.